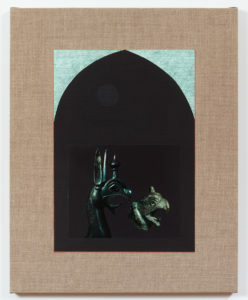 James Harris Gallery | Kamrooz Aram, "New Work"
James Harris Gallery is pleased to present the first solo show in Seattle by Brooklyn based artist Kamrooz Aram. Featuring both painting and collage, this show offers an introduction to Aram’s multifaceted practice. Over the past several years, Aram has continued to investigate the possibilities for abstraction to engage critical content, mainly by exploring the complex historical relationship between Modernism and ornament. In his exploration of the ornamental, Aram suggests that this term can be just as easily ascribed to much of Modernist abstraction, as it is to the patterning of Persian carpets. 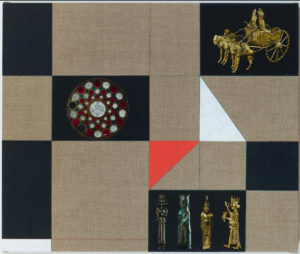 Aram’s application of emblematic motifs from these varied histories evokes Modernism’s fear of and disdain for ornament, and renegotiates the hierarchies established by Eurocentric art history. 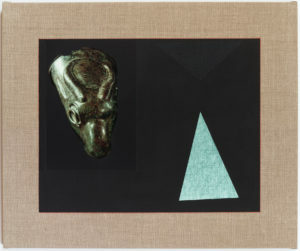 In gallery one, Aram presents works from his ongoing Palimpsest series. The term “palimpsest” comes from an ancient Greek word meaning “scraped clean and used again”. 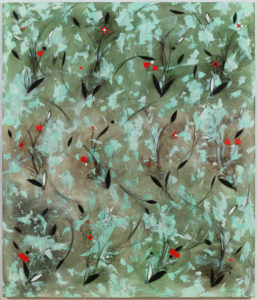 In this spirit, Aram’s layered painterly process begins with a floral pattern taken directly from Persian carpets that the artist has photographed in New York carpet stores. This motif is drawn across the canvas in the form of a grid and then wiped away with solvent and rags, leaving only traces to be excavated and rebuilt. 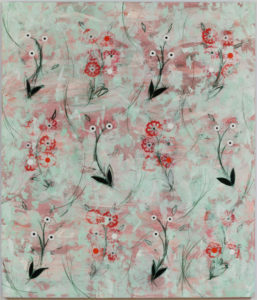 Through a lengthy process of building and destroying the image, the floral elements dissipate into a complex pattern of gestural brushwork, wipes, stains and streaks. The result is both expressionistic and ornamental, revealing that these terms are not mutually exclusive. 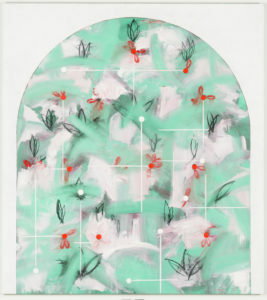 In the most recent paintings, the artist has introduced a one-centered arch that dictates the composition of three of the paintings in the exhibition. The symbolism of the arch can function as a powerful political emblem: as a monument to cultural greatness in its reference to imperial Roman architecture, or perhaps even Italian Fascist architecture. For Aram, the arch marks a blurring between design and ornamentation, high modernist art, and architecture in a way that elevates them all to an equally symbolic state associated with the sublime while engaging in skepticism of such claims. 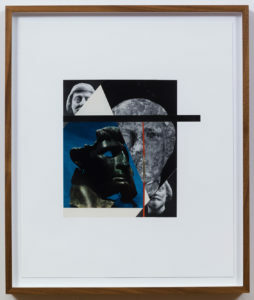 Aram’s collage works located in gallery two are part of a series he began in 2010 entitled 7000 years, later expanded to a larger project titled Ancient Through Modern. In these works, Aram explores the ways in which we use objects and images from the past to identify ourselves in the present. 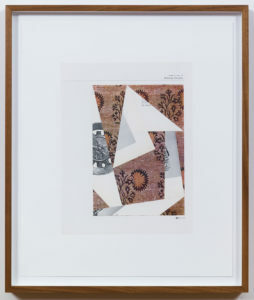 The collages are constructed from the pages of several books cataloguing ancient Iranian artworks, which were published primarily in the 1950’s and 60’s. The objects depicted evoke what the artist calls “cultural nostalgia,” a longing for one’s glorious past – a past that can also be seen as a construction or myth. By mediating these forms through decidedly Modernist geometrical compositions, the artist draws our attention to a similar form of nostalgia, that for the authenticity of early Modern art. Aram challenges the romanticism of authenticity, and how we attach significance to an object based on its history and lineage. Aram’s work possesses such specificity in one moment only to be renegotiated the next, revealing how context alters perceptions, established hierarchies, and our valuations of art objects. 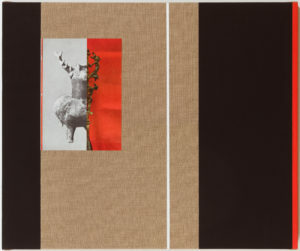 In many ways his practice is destabilizing, aimed to provoke multiple readings that challenge perceived taxonomies. From another perspective, his approach can be considered unifying, an art that renews the past to affect the present. 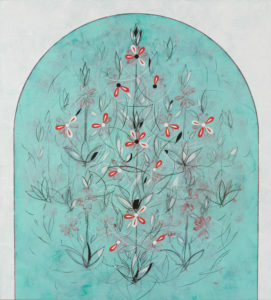 Kamrooz Aram (born 1978, Shiraz) received his MFA from Columbia University in 2003. Aram is the winner of the Abraaj Group Art Prize 2014; he has also been awarded grants from the New York Foundation for the Arts (2004) and the Jacob K. Javits Fellowship Program (2001-2003). His work is in the collections of The Metropolitan Museum of Art, New York; M+ Museum, Hong Kong; Cincinnati Art Museum, Ohio; The FLAG Foundation, New York; and Deutsche Bank Collection among others. 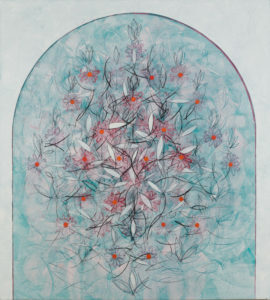 Aram’s practice has been widely featured and reviewed in publications such as The New York Times, Art in America, Artforum.com, ArtAsiaPacific, The New Yorker, The National and Bidoun. He lives and works in Brooklyn, NY.